When: Wednesday, March 4, 2015 – 8:30pm. Rusty Miller is an internationally respected surfing icon, historian and author from San Diego who now resides in Byron Bay, Australia. 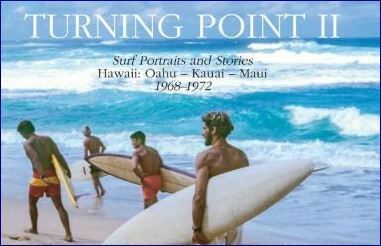 He is in town to promote his new book release – Turning Point II – that captures a defining time in surfing, from 1968 to 1972, through his own images and collection of stories that took place in Hawaii during those years. A former US Surfing Champion and finalist in the famous Duke Kahanamoku Invitational here at Sunset Beach, Rusty will share his personal insights and stories from a fascinating period of surfing’s history that helped shaped the sport as we know it today.